There are multiple Dodger Stadium Parking entrances. To avoid traffic you can map out your route to Dodger Stadium via Google Maps. There is $5.00 parking available at Dodger Stadium Parking Off-Site Locations. These are Dodger Stadium Parking Lot 13 and Lot 14 and cost just $5.00. Please note these are offsite on Stadium Way and allow for easy entrance and exit into Dodger Stadium. There is an uphill walk to the Stadium from these lots. 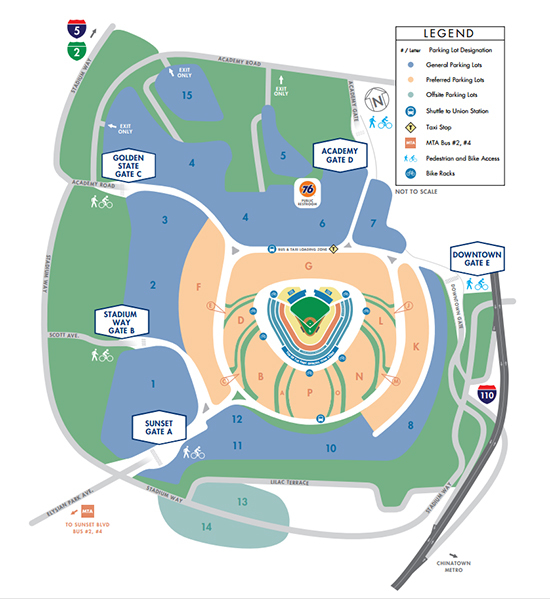 For the easiest convenience of parking at the stadium if you purchased Dodger Stadium Parking in a specific Lot. (i.e. 1st base side 3rd base side) Its best to plan ahead. Make sure that you enter Dodger Stadium parking lot via the appropriate gate. Here is a list. Sunset Gate A Lots 1 and 2. Stadium Way Gate B Lot 2 – General parking only. Golden State Gate C Lots 3 and 4. Academy Gate D Lots 5, 6, and 7. Downtown Gate E Lots 8, 10 and 11. Dodger Stadium does not allow moving between lots. Car share vehicles can enter the ballpark parking lot through Sunset Gate A only. After the Dodgers Game or Event, car share vehicles will be permitted to enter Sunset Gate A to pick up their passengers in Lot 12. Preferred Dodger Stadium parking price can cost $35.00 on average. Stadium parking price on the secondary market can also depend on the availability of parking passes as well as the event. When do the gates at Dodger Stadium open? All five Dodger Stadium Parking entrances open two and half hours before the scheduled game or event time. Yes, there is a speed limit inside the parking lot of 14 miles per hour. The speed limit is strictly enforced. Can we tailgate in the parking lot? Sorry but tailgating as well as the consumption of any alcohol is strictly prohibited in any of the Dodger Stadium Parking Lots. 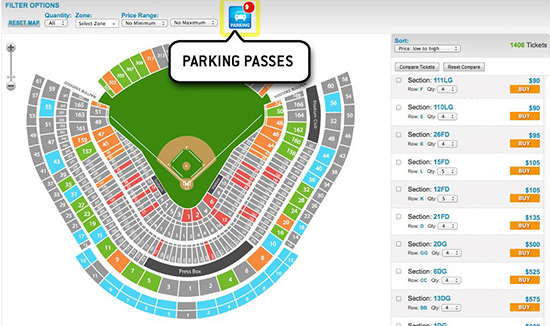 Barry’s Tickets offers Dodger Stadium VIP Parking for all games. When you choose the Dodgers game you would like to attend you can use our Interactive Seating Chart to help you decide on your tickets as well as Dodger Stadium Vip Parking map. Updated April 2015: The Los Angeles Dodgers have added “prepaid lanes” for fans who purchase Dodger Stadium parking in the general lots and Dodger Stadium VIP Parking. Upon entering Dodger Stadium follow the signage to these prepaid auto booths. All gates have dedicated Dodger Stadium Parking and Dodger Stadium VIP Parking prepaid lanes. Purchasing your Dodger Stadium Parking passes in advance of getting to Dodger Stadium fans will help you get into the Stadium without having to wait in the general Dodger Stadium parking entrance. This aid traffic flow and movement through the Dodgers auto gates. Save on Dodgers Tickets today! [/insert_php] View The Complete Dodgers Home Games Schedule. BarrysTickets.com secondary ticketing market data has been used and trusted since 1985. 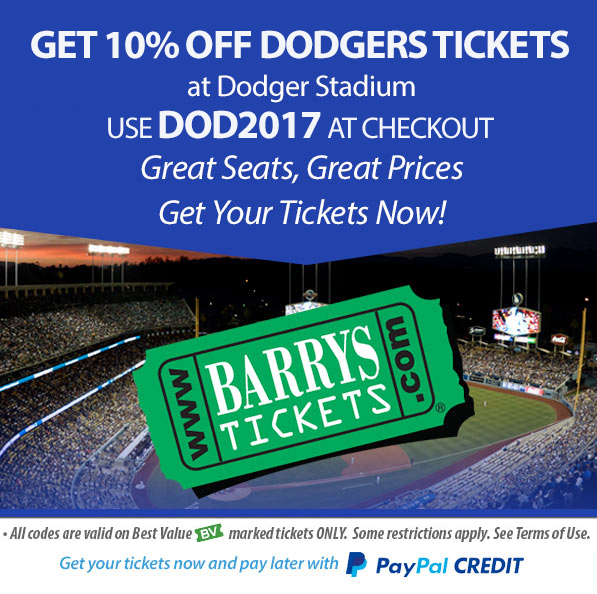 Barry’s Tickets offers 100% Guaranteed Authentic Dodgers Game tickets and Dodger Stadium Parking Passes for all The Dodgers Games. Dodgers Events and Promotions are subject to change without notice. Please refer to the Dodgers Official Website if you have any questions regarding parking as Barry’s Tickets is not responsible for any changes in parking rules and regulations. You can also checkout our Dodgers Tickets Promo Code to save on your Dodgers Game Tickets! Other Dodgers Articles that might interest you. You can checkout our Dodgers Tickets Buying Guide For 2015. Checkout the view from the Top Deck seats. Learn about Dodgers Dugout Club seats. Checkout Field Box Views at Dodger Stadium. Pingback: Dodger Stadium: Stop By Chavez Ravine Today! Pingback: Dodgers Managers Guide since 1884 till today. This is some really good information about getting sports tickets. I like that you talked about knowing where to park. It didn’t even think about that because that can effect when you leave early. My party of 4 senior citizens is attending the Paul McCartney concert on July 13, 2019. I use a cane and have a CA Handicap Parking Placard. Our seats are in the In-field Box 29. I would like to buy a Parking Permit, but I don’t know the closest lot in which to park. Please advise. Thank you very much.